If Ya Gotta Go Sue-ioux….make mine a Blond German from Copeland. 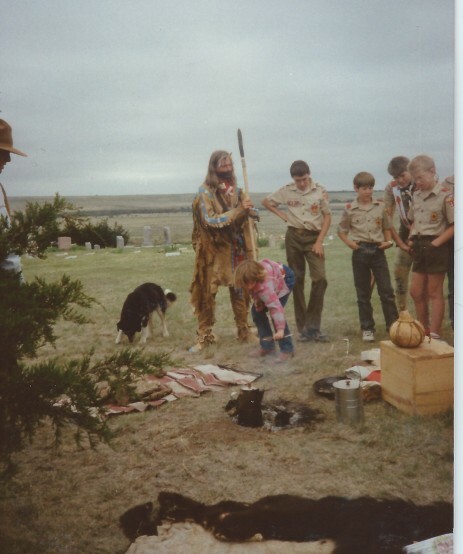 Ken Widener showing tanned hides to Boy Scout, Lutheran Stone School 15 miles south of Meade Kansas. Folk Arts Festival at the Stone School, summer 1989. We had two Folk Arts Festivals at a one-room Schoolhouse south of Meade, Kansas. There were over a 1,000 people in attendance at the first, and this was on the day of a huge rainstorm. It’s always time to party when it rains in southwest Kansas. Fritz Davis from the Kansas Touring Program playing for all of us. Later, “pickup” musicians from Fowler brought in their bass and guitar to jam inside the schoolhouse when the rain started to come down. It was pretty magical, have the footage but it’s on different era of video or I’d stick it in here, not lost though. Goodnight Irene…..remember this vividly with rain on the roof….it came back to me at Yoga this morning in downtown Overland Park with the rain on the roof, though not sure why because the music was something with shiva in the words and I still don’t know what that means, but it was peaceful. PS What I most remember about Ken, who had icy blue eyes and curly blond hair, was his comment about dating. So back to his comment. He said that he needed a wife because the women did the beadwork. I didn’t take this wrong, he just needed a support system and later found a wonderful person. That’s called “Making something beautiful is worth doing well.” It sometimes takes a lot of spirit to get the job Done.